The queen of perfume and scented candles is winning over the hearts of Brits and New Yorkers once again with her newly launched product line, Jo Loves. 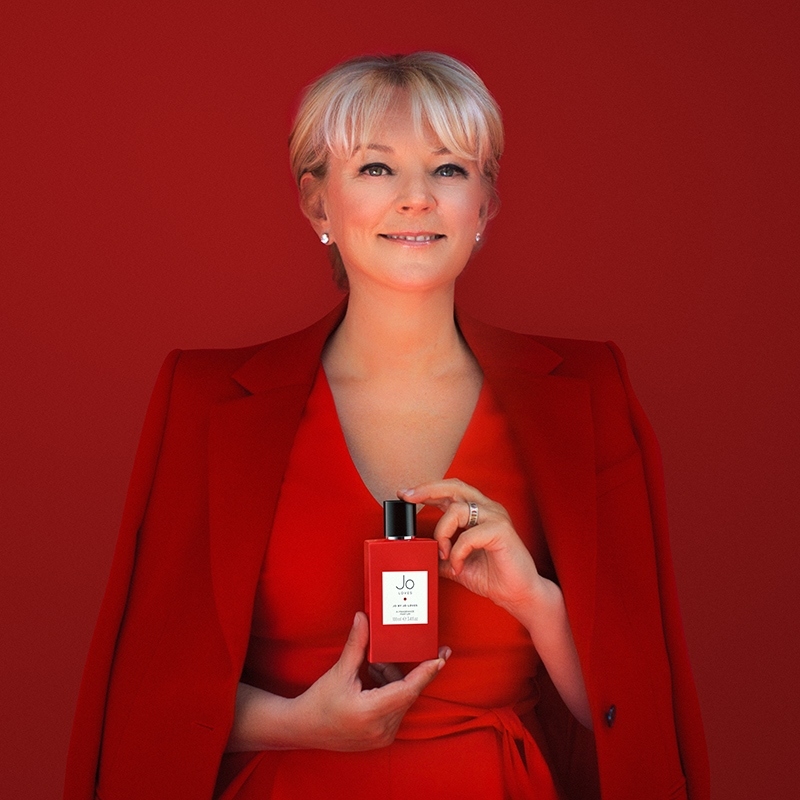 Known as the ‘English Scent Maverick,’ Jo Malone first stormed perfumeries and fragrance shops with her seductive brand of fragrances and bath and body wear in 1994—opening her first stomping ground in London and second in Bergdorf Goodman. Taking over the runway for all things scented, she’s now opening up a whole new world of beauty—a second time around—to New Yorkers and global fans. With innovative products like fragrance paintbrushes, Malone is ready to scent the world with fierce Red Truffle aromas like she never did before. So we sat down with Malone, to hear more about her new brand, Jo Loves, the story behind her beloved line Jo Malone, and what she has in store for the future for her New York and global fans. Jo, tell us about Jo Loves! JO MALONE: It’s my second brand that I created. I missed creating fragrances so much and being a part of the industry, that I felt life was too long and too short not to try again. So Jo Loves is all about the young woman who’s still the shopkeeper—about 25 years a part. So, 25 years next year is all the time that I’ve been a shopkeeper and in that time, like any person, I’ve grown and changed. My creativity has changed. And Jo Loves is the extension of your creativity, the extension of bravery being in the business, and delving into finding inspirational, innovational kind of things and bringing them to the market. I don’t want to just create another candle. I want to do it differently and twist it and see what other industries I can collaborate with and change the world. What inspired you to create this new luxury brand? JM: My love of life. My love of fragrance, my love of business. I don’t think it’s very good for somebody to sit and do nothing and it’s certainly not good for me. It’s about creating and building and I think once you’ve done that in your life and you’ve had the taste of that creativity, there’s very few things that beat it. I thought about getting myself a job and going back to working that way. But I’m an entrepreneur. I’m used to being the one in the driver’s seat. I’m used to being the one who’s coming up with the ideas. So Jo Loves is really the fulfillment in that. It was mentioned that Jo Loves specializes specifically in fragrance, bath, body, and candles, each of which are inspired by memories and moments in your life. Tell us more. JM: I’m telling you a story of my life through my sense of smell. Green orange and coriander for instance, is the snowy sidewalks of New York City on a Sunday brunch with big cashmere sweaters. I see textures and colors and pieces of music and they all translate back into sense of smell for me. So that’s what I’m doing, is that I’m recalling or reliving. Each one is telling you who I am and the story that life taught me or showed me, and I translate it back into a fragrance. JM: I launched a fragrance called Jo and you can only do that once in your lifetime. It is my past, present, and future. It’s all of my memories of grapefruit. That one is definitely my favorite fragrance and I’ve been wearing it for a whole year—just me—before it was released. And I feel, it’s almost like a very, very special dear friend to me. That smell. And I love the paintbrush. I created a product, where I wanted to change the way the whole world did something—once in my lifetime. And I believe it’s the paintbrush. How did you first decide, to design the world’s first fragrant paintbrush? JM: My husband said to me once, that once in your lifetime you need to change the direction and the habits of the whole world. So I was painting a fragrance one morning on my skin—creating—and I suddenly realized, that was it. That could I take a paintbrush and say to people, instead of just spraying your fragrance, you could paint yourself. And it’s the one thing that’s transformed my business, it’s transformed the way people look at me, and it’s brought in that millennial generational in such a new and vibrant way. It’s been a really exciting chapter for me to follow that through. Known as the "English Scent Maverick," what would you say makes Jo Loves different from Jo Malone? JM: Me! It has the same creative copy. I don’t relate creatively to the brand anymore but I still love what I created all those years ago. But I think if you look at anybody’s creativity—a musician or a fashion designer—you move on. Life changes you and the way you see life and how you interpret it, that’s your creative work. So, it didn’t interest me, and I wouldn’t have wanted to, go back and repeat what I had done before. I didn’t set out to be different, I am different. I’ve grown up, I’m bolder. In addition to the fragrant paintbrush, what other new products can we look forward to seeing? JM: I have a 17 year old son who has challenged me over sustainability and rightly so, and the way that we package. So we’ve had a look at some of those things and how we embrace the collaboration creatively all together. So the storytelling you’ll find will get much more meaningful and I’m looking forward to all of those kinds of sides of things. As to the venues in which the product sits, we’re going to bring much more fiercer entertainment and circus into the arena of retail, which retail definitely needs. Where can New York locals find Jo Loves? JM: Across the United States, we’re in, I can’t remember how many Sephora stores and we’re starting to do a couple more projects to get the product more visible but places not necessarily that you would expect. What scent do you recommend New Yorkers to try? JM: I think green orange and coriander because it was created in New York City, but I got to say our Jo by Jo Loves. It’s so clean, it’s so citrus, it’s not male, it’s not female. It’s in a beautiful red bottle and for me, it’s probably the one I’m most proud of. And I lived in New York City for a year and I love New York and I love New Yorkers. So, always give New York your best and I think Jo by Jo Loves is my best. And for your loyal fans, what is the story of initially creating Jo Malone? JM: I started in skincare, I was a beautician. And I would create a body lotion, which I then created into bath oils, and I taught myself how to create fragrance. So it was really from kitchen sink to plastic jugs to little plastic bottles and the product just took off and the rest is history. With your second luxury product launch, what are your plans for the future? JM: Continuing to create fragrances with authenticity and integrity.